We’ve now had the first week of the Rugby World Cup 2015, held in England, and by tonight when New Zealand face Namibia every team will have played at least once. Rugby is a complex and data rich sport so I was interested to see what data visualisations I could find about the tournament. Perhaps because rugby is so complex collecting and coding data is quite an effort with top quality offered by the likes of Opta (and their Opta Jonny twitter account) who then sell those data feeds, and their visualisations and editorial, commercially for use typically by the major broadcasters and media publications. There is also detailed match statistics on the Rugby World Cup official site in both their Match Centre (see the stats for ENG vs FJI) and their Stats Hub. It’s detailed, professional and authoritative. I haven’t yet seen many interesting visualisations using Rugby World Cup data but more might emerge as the tournament progresses. Tableau have provided two of the more interesting ones. 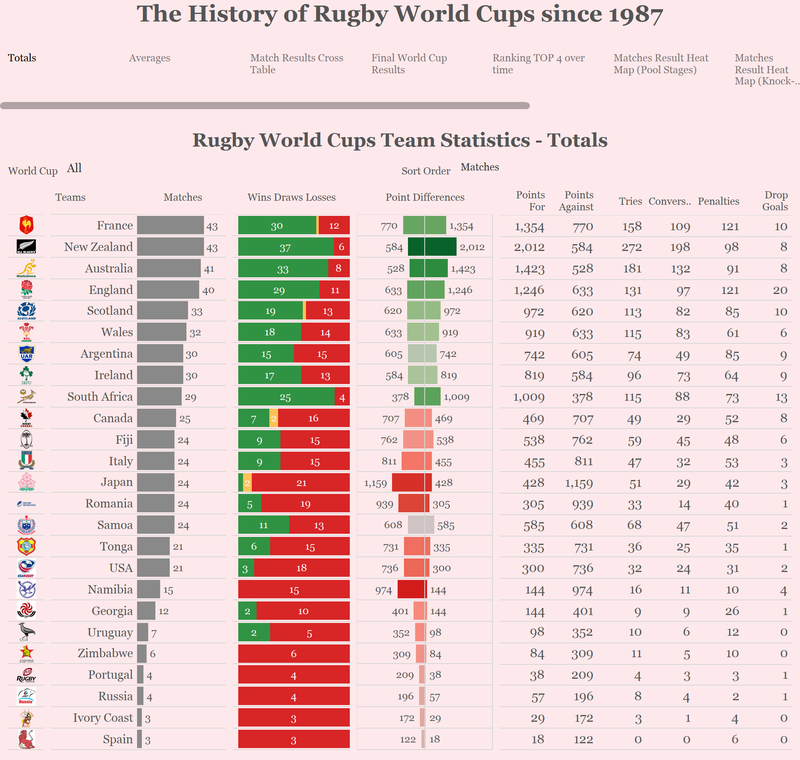 In The History of Rugby World Cups since 1987 they compile a dashboard featuring summary and comparative data. It’s pretty good and features summaries, progression heat maps, head to head records and detailed team overviews. Despite my efforts at banter with my antipodean friends the evidence here strongly supports the strength of Southern Hemisphere teams in the competition. France really do emerge as the best team never to have won a world cup and Ireland, you would think, should finally improve their rather underwhelming world cup record. Their second visualisation is described as a Visual Prediction. 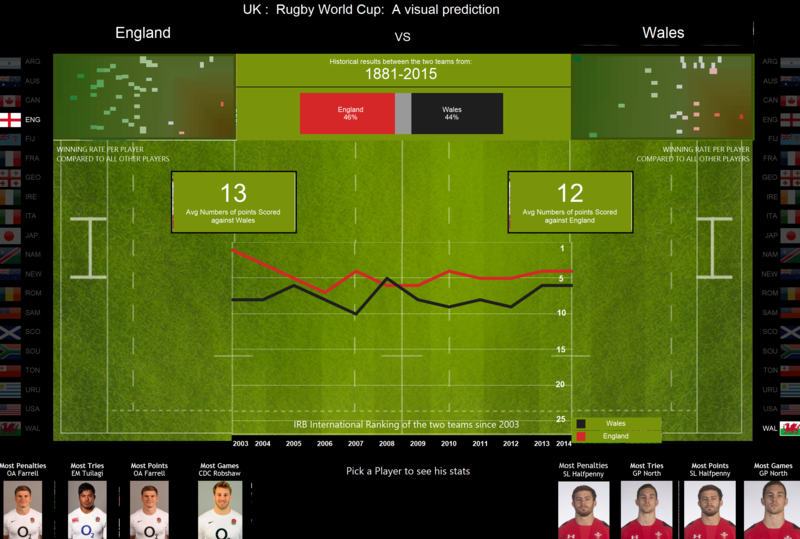 It’s hard to see why as there’s no obvious model behind it, but it does offer a good head to head history of two teams showing that England’s epic clash against Wales on Saturday evening will likely be closely fought. Rather confusingly there’s also player statistics in here somewhere but there’s no obvious navigation or filter and the tableau workbook for this visualisation isn’t available to download.